Height: 24" 24 1/8" 24 1/4" 24 3/8" 24 1/2" 24 5/8" 24 3/4" 24 7/8" 25" 25 1/8" 25 1/4" 25 3/8" 25 1/2" 25 5/8" 25 3/4" 25 7/8" 26" 26 1/8" 26 1/4" 26 3/8" 26 1/2" 26 5/8" 26 3/4" 26 7/8" 27" 27 1/8" 27 1/4" 27 3/8" 27 1/2" 27 5/8" 27 3/4" 27 7/8" 28" 28 1/8" 28 1/4" 28 3/8" 28 1/2" 28 5/8" 28 3/4" 28 7/8" 29" 29 1/8" 29 1/4" 29 3/8" 29 1/2" 29 5/8" 29 3/4" 29 7/8" 30" 30 1/8" 30 1/4" 30 3/8" 30 1/2" 30 5/8" 30 3/4" 30 7/8" 31" 31 1/8" 31 1/4" 31 3/8" 31 1/2" 31 5/8" 31 3/4" 31 7/8" 32" 32 1/8" 32 1/4" 32 3/8" 32 1/2" 32 5/8" 32 3/4" 32 7/8" 33" 33 1/8" 33 1/4" 33 3/8" 33 1/2" 33 5/8" 33 3/4" 33 7/8" 34" 34 1/8" 34 1/4" 34 3/8" 34 1/2" 34 5/8" 34 3/4" 34 7/8" 35" 35 1/8" 35 1/4" 35 3/8" 35 1/2" 35 5/8" 35 3/4" 35 7/8" 36" 36 1/8" 36 1/4" 36 3/8" 36 1/2" 36 5/8" 36 3/4" 36 7/8" 37" 37 1/8" 37 1/4" 37 3/8" 37 1/2" 37 5/8" 37 3/4" 37 7/8" 38" 38 1/8" 38 1/4" 38 3/8" 38 1/2" 38 5/8" 38 3/4" 38 7/8" 39" 39 1/8" 39 1/4" 39 3/8" 39 1/2" 39 5/8" 39 3/4" 39 7/8" 40" 40 1/8" 40 1/4" 40 3/8" 40 1/2" 40 5/8" 40 3/4" 40 7/8" 41" 41 1/8" 41 1/4" 41 3/8" 41 1/2" 41 5/8" 41 3/4" 41 7/8" 42" 42 1/8" 42 1/4" 42 3/8" 42 1/2" 42 5/8" 42 3/4" 42 7/8" 43" 43 1/8" 43 1/4" 43 3/8" 43 1/2" 43 5/8" 43 3/4" 43 7/8" 44" 44 1/8" 44 1/4" 44 3/8" 44 1/2" 44 5/8" 44 3/4" 44 7/8" 45" 45 1/8" 45 1/4" 45 3/8" 45 1/2" 45 5/8" 45 3/4" 45 7/8" 46" 46 1/8" 46 1/4" 46 3/8" 46 1/2" 46 5/8" 46 3/4" 46 7/8" 47" 47 1/8" 47 1/4" 47 3/8" 47 1/2" 47 5/8" 47 3/4" 47 7/8" 48" 48 1/8" 48 1/4" 48 3/8" 48 1/2" 48 5/8" 48 3/4" 48 7/8" 49" 49 1/8" 49 1/4" 49 3/8" 49 1/2" 49 5/8" 49 3/4" 49 7/8" 50" 50 1/8" 50 1/4" 50 3/8" 50 1/2" 50 5/8" 50 3/4" 50 7/8" 51" 51 1/8" 51 1/4" 51 3/8" 51 1/2" 51 5/8" 51 3/4" 51 7/8" 52" 52 1/8" 52 1/4" 52 3/8" 52 1/2" 52 5/8" 52 3/4" 52 7/8" 53" 53 1/8" 53 1/4" 53 3/8" 53 1/2" 53 5/8" 53 3/4" 53 7/8" 54" 54 1/8" 54 1/4" 54 3/8" 54 1/2" 54 5/8" 54 3/4" 54 7/8" 55" 55 1/8" 55 1/4" 55 3/8" 55 1/2" 55 5/8" 55 3/4" 55 7/8" 56" 56 1/8" 56 1/4" 56 3/8" 56 1/2" 56 5/8" 56 3/4" 56 7/8" 57" 57 1/8" 57 1/4" 57 3/8" 57 1/2" 57 5/8" 57 3/4" 57 7/8" 58" 58 1/8" 58 1/4" 58 3/8" 58 1/2" 58 5/8" 58 3/4" 58 7/8" 59" 59 1/8" 59 1/4" 59 3/8" 59 1/2" 59 5/8" 59 3/4" 59 7/8" 60" 60 1/8" 60 1/4" 60 3/8" 60 1/2" 60 5/8" 60 3/4" 60 7/8" 61" 61 1/8" 61 1/4" 61 3/8" 61 1/2" 61 5/8" 61 3/4" 61 7/8" 62" 62 1/8" 62 1/4" 62 3/8" 62 1/2" 62 5/8" 62 3/4" 62 7/8" 63" 63 1/8" 63 1/4" 63 3/8" 63 1/2" 63 5/8" 63 3/4" 63 7/8" 64" 64 1/8" 64 1/4" 64 3/8" 64 1/2" 64 5/8" 64 3/4" 64 7/8" 65" 65 1/8" 65 1/4" 65 3/8" 65 1/2" 65 5/8" 65 3/4" 65 7/8" 66" 66 1/8" 66 1/4" 66 3/8" 66 1/2" 66 5/8" 66 3/4" 66 7/8" 67" 67 1/8" 67 1/4" 67 3/8" 67 1/2" 67 5/8" 67 3/4" 67 7/8" 68" 68 1/8" 68 1/4" 68 3/8" 68 1/2" 68 5/8" 68 3/4" 68 7/8" 69" 69 1/8" 69 1/4" 69 3/8" 69 1/2" 69 5/8" 69 3/4" 69 7/8" 70" 70 1/8" 70 1/4" 70 3/8" 70 1/2" 70 5/8" 70 3/4" 70 7/8" 71" 71 1/8" 71 1/4" 71 3/8" 71 1/2" 71 5/8" 71 3/4" 71 7/8" 72" 72 1/8" 72 1/4" 72 3/8" 72 1/2" 72 5/8" 72 3/4" 72 7/8" 73" 73 1/8" 73 1/4" 73 3/8" 73 1/2" 73 5/8" 73 3/4" 73 7/8" 74" 74 1/8" 74 1/4" 74 3/8" 74 1/2" 74 5/8" 74 3/4" 74 7/8" 75" 75 1/8" 75 1/4" 75 3/8" 75 1/2" 75 5/8" 75 3/4" 75 7/8" 76" 76 1/8" 76 1/4" 76 3/8" 76 1/2" 76 5/8" 76 3/4" 76 7/8" 77" 77 1/8" 77 1/4" 77 3/8" 77 1/2" 77 5/8" 77 3/4" 77 7/8" 78" 78 1/8" 78 1/4" 78 3/8" 78 1/2" 78 5/8" 78 3/4" 78 7/8" 79" 79 1/8" 79 1/4" 79 3/8" 79 1/2" 79 5/8" 79 3/4" 79 7/8" 80" 80 1/8" 80 1/4" 80 3/8" 80 1/2" 80 5/8" 80 3/4" 80 7/8" 81" 81 1/8" 81 1/4" 81 3/8" 81 1/2" 81 5/8" 81 3/4" 81 7/8" 82" 82 1/8" 82 1/4" 82 3/8" 82 1/2" 82 5/8" 82 3/4" 82 7/8" 83" 83 1/8" 83 1/4" 83 3/8" 83 1/2" 83 5/8" 83 3/4" 83 7/8" 84" 84 1/8" 84 1/4" 84 3/8" 84 1/2" 84 5/8" 84 3/4" 84 7/8" 85" 85 1/8" 85 1/4" 85 3/8" 85 1/2" 85 5/8" 85 3/4" 85 7/8" 86" 86 1/8" 86 1/4" 86 3/8" 86 1/2" 86 5/8" 86 3/4" 86 7/8" 87" 87 1/8" 87 1/4" 87 3/8" 87 1/2" 87 5/8" 87 3/4" 87 7/8" 88" 88 1/8" 88 1/4" 88 3/8" 88 1/2" 88 5/8" 88 3/4" 88 7/8" 89" 89 1/8" 89 1/4" 89 3/8" 89 1/2" 89 5/8" 89 3/4" 89 7/8" 90" 90 1/8" 90 1/4" 90 3/8" 90 1/2" 90 5/8" 90 3/4" 90 7/8" 91" 91 1/8" 91 1/4" 91 3/8" 91 1/2" 91 5/8" 91 3/4" 91 7/8" 92" 92 1/8" 92 1/4" 92 3/8" 92 1/2" 92 5/8" 92 3/4" 92 7/8" 93" 93 1/8" 93 1/4" 93 3/8" 93 1/2" 93 5/8" 93 3/4" 93 7/8" 94" 94 1/8" 94 1/4" 94 3/8" 94 1/2" 94 5/8" 94 3/4" 94 7/8" 95" 95 1/8" 95 1/4" 95 3/8" 95 1/2" 95 5/8" 95 3/4" 95 7/8" 96" 96 1/8" 96 1/4" 96 3/8" 96 1/2" 96 5/8" 96 3/4" 96 7/8" 97" 97 1/8" 97 1/4" 97 3/8" 97 1/2" 97 5/8" 97 3/4" 97 7/8" 98" 98 1/8" 98 1/4" 98 3/8" 98 1/2" 98 5/8" 98 3/4" 98 7/8" 99" 99 1/8" 99 1/4" 99 3/8" 99 1/2" 99 5/8" 99 3/4" 99 7/8" 100" 100 1/8" 100 1/4" 100 3/8" 100 1/2" 100 5/8" 100 3/4" 100 7/8" 101" 101 1/8" 101 1/4" 101 3/8" 101 1/2" 101 5/8" 101 3/4" 101 7/8" 102" 102 1/8" 102 1/4" 102 3/8" 102 1/2" 102 5/8" 102 3/4" 102 7/8" 103" 103 1/8" 103 1/4" 103 3/8" 103 1/2" 103 5/8" 103 3/4" 103 7/8" 104" 104 1/8" 104 1/4" 104 3/8" 104 1/2" 104 5/8" 104 3/4" 104 7/8" 105" 105 1/8" 105 1/4" 105 3/8" 105 1/2" 105 5/8" 105 3/4" 105 7/8" 106" 106 1/8" 106 1/4" 106 3/8" 106 1/2" 106 5/8" 106 3/4" 106 7/8" 107" 107 1/8" 107 1/4" 107 3/8" 107 1/2" 107 5/8" 107 3/4" 107 7/8" 108" 108 1/8" 108 1/4" 108 3/8" 108 1/2" 108 5/8" 108 3/4" 108 7/8" 109" 109 1/8" 109 1/4" 109 3/8" 109 1/2" 109 5/8" 109 3/4" 109 7/8" 110" 110 1/8" 110 1/4" 110 3/8" 110 1/2" 110 5/8" 110 3/4" 110 7/8" 111" 111 1/8" 111 1/4" 111 3/8" 111 1/2" 111 5/8" 111 3/4" 111 7/8" 112" 112 1/8" 112 1/4" 112 3/8" 112 1/2" 112 5/8" 112 3/4" 112 7/8" 113" 113 1/8" 113 1/4" 113 3/8" 113 1/2" 113 5/8" 113 3/4" 113 7/8" 114" 114 1/8" 114 1/4" 114 3/8" 114 1/2" 114 5/8" 114 3/4" 114 7/8" 115" 115 1/8" 115 1/4" 115 3/8" 115 1/2" 115 5/8" 115 3/4" 115 7/8" 116" 116 1/8" 116 1/4" 116 3/8" 116 1/2" 116 5/8" 116 3/4" 116 7/8" 117" 117 1/8" 117 1/4" 117 3/8" 117 1/2" 117 5/8" 117 3/4" 117 7/8" 118" 118 1/8" 118 1/4" 118 3/8" 118 1/2" 118 5/8" 118 3/4" 118 7/8" 119" 119 1/8" 119 1/4" 119 3/8" 119 1/2" 119 5/8" 119 3/4" 119 7/8" 120"
3" wide or 4" wide vertical boards, depends on shutter with ordered. Optional diagonal batten for barn door effect. 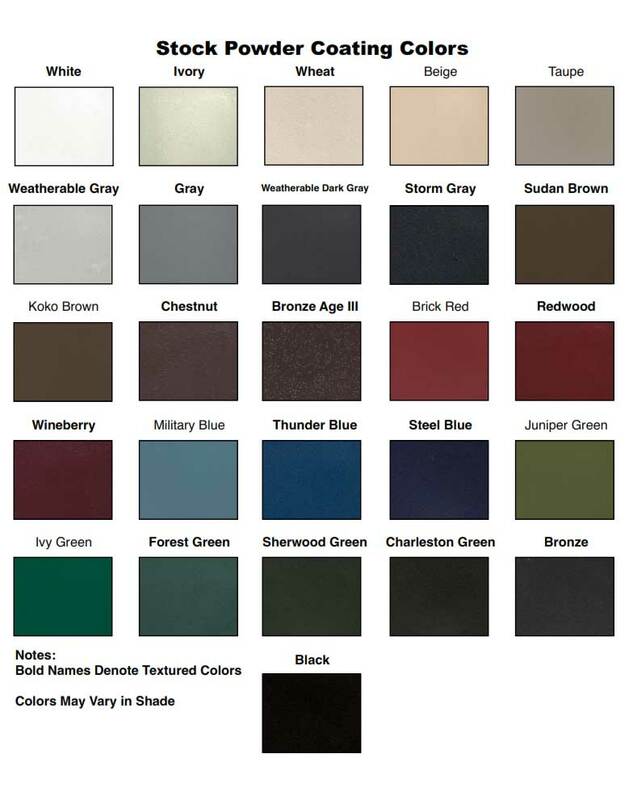 Quality Powder Coat Finish.in 26 stock colors. NOTE: Decorative shutters only, not for hinged functional use.